Keepin’ it short today–we’re all sick and we have cleaned up more vomit in the past 24 hours than we have cumulatively over the past 6 months. Fingers crossed that it has passed by the time I wake up in the morning. I rad Cory’s alt text adventure today and for a moment I was incredulous that he was suggesting that the Ith played some sort of weird political Fantasy Football, but he clarified that it’s actually more like political LARPing, which is somehow better??? 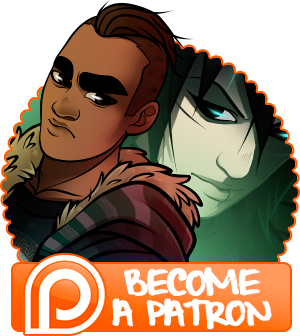 He’ll be doing some fun bonus content and writing based on that for Patrons as soon as he can get to it. Anyhow, cheers! We’ll see you all on Friday!